Find a Classic Home retail store in your local area using our dealer locator. 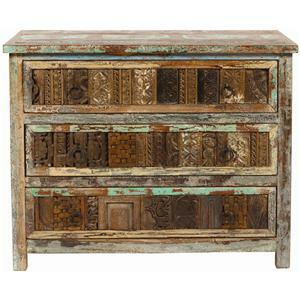 Made of reclaimed wood, this accent chest with three drawers makes a stunning accent in your living room. It's inspired by the hand tools used in the ancient art of printing fabrics and centuries-old hand carved panels adorning the inside and facades of aged buildings. The colorful reclaimed wood features generations of history in every unique piece. Restored and available for a new, eco-friendly generation, the artisan craftsmanship and authentic design makes for a fantastic piece for your home. Important Note: A lead free lacquer sealant has been applied to the distressed paint on each piece. The Vintage Print Block 3 Drawer Chest by Classic Home is available in the area from FMG - Local Home Furnishing. Made of reclaimed wood, each of the items in the Vintage collection a one-of-a-kind piece to enhance your home with unique, rustic design. Within this collection you will find Vintage Print Block items inspired by ancient art of printing fabrics, Vintage Old World Treasures restored for appreciation by a new, eco-friendly generation, and Vintage Multi-Color pieces made of a patchwork of wood planks sourced and reclaimed from old ships and demolished buildings and crafted by artisans into colorful accent pieces. The Vintage collection is a great option if you are looking for Rustic furniture in the area. Wood & Finish Each piece is unique. Color, distress and carvings will vary from piece to piece.